A 6th form college at Reepham High School in Norfolk has retrofitted a series of alwitra® Evalon® Solar roof panels across its extensive roof, helping to achieve the architect’s aim of high thermal performance levels, lowest possible energy demand and the highest levels of comfort. This flexible photovoltaic roof is capable of producing up to 20% more output than other more common crystalline cell types. Specified by Teather + Walls Architects, alwitra® Evalon® solar photovoltaic panels proved the natural choice for the project as the alwitra® Evalon® V single ply polymeric membrane was installed a year before. Applied at an angle of 10°, this would allow for a simple and efficient solar upgrade when funding became available, as well as ensuring the cells would be self-cleaning. For the original roofing application, specialist contractor Total Roofing Services Ltd applied Evalon® V in dark grey. With its world class waterproofing qualities, Alwitra Evalon® V is a unique membrane that delivers the ultimate low cost, long term solution whilst also offering the architect the most compatible substrate for the integration of solar PV panels. Ideal for any climate, this flexible photovoltaic roof is capable of producing up to 20% more output than other more common crystalline cell types. Generating power from direct and diffused light, the advanced PV cells can provide 3704kWh of energy per year. The thin film triple junction technology used in Evalon® Solar PV cells allows effective harvesting of solar energy on any roof with a pitch of above 3°. Supplied with a 20 year performance guarantee, alwitra EVALON® Solar is one of the most innovative solutions on the market. 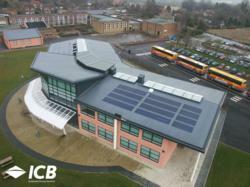 Following the successful completion of the project, the new Reepham Sixth Form College received a number of construction industry awards for its innovative design and build elements, including the New Commercial Building Award at the 2011 Norfolk Association of Architects Craftsmanship Awards.